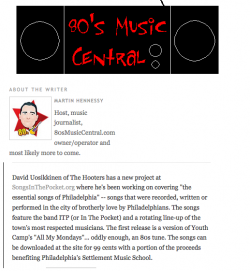 …In other Philly-covers-Philly news, The Hooters’ David Uosikkinen’s new revolving-member project ITP (In The Pocket) is recording his fave Philly tunes with proceeds of their download charges (songsinthepocket.org) going to SettlementMusicSchool. The first tune? “All My Mondays” from the late great Joey Wilson’s ’80s band Youth Camp with John Kuzma and Uosikkinen. 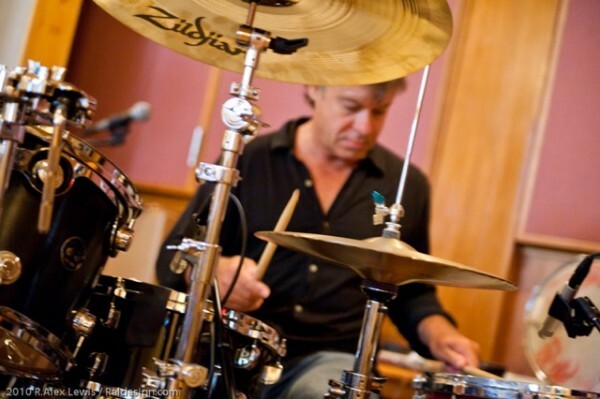 The new version features Hooters Uosikkinen, Rob Hyman, Eric Bazilian with Richard Bush (The A’s/The Peace Creeps) on vocals and Greg Davis (Beru Revue) on guitar. The Hooters’ David Uosikkinen is recording what he feels are “the Essential Songs of Philadelphia,” songs which were either recorded in Philly or written and performed by Philadelphians. These essential songs will feature the band ITP (In The Pocket), a rotating lineup of Philly’s most respected musicians. 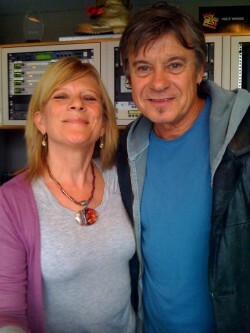 The first song, “All My Mondays,” is available for download for 99 cents at songsinthepocket.org. “All My Mondays” was originally recorded by ’80s band Youth Camp. A portion of the proceeds will benefit Philadelphia’s Settlement Music School. 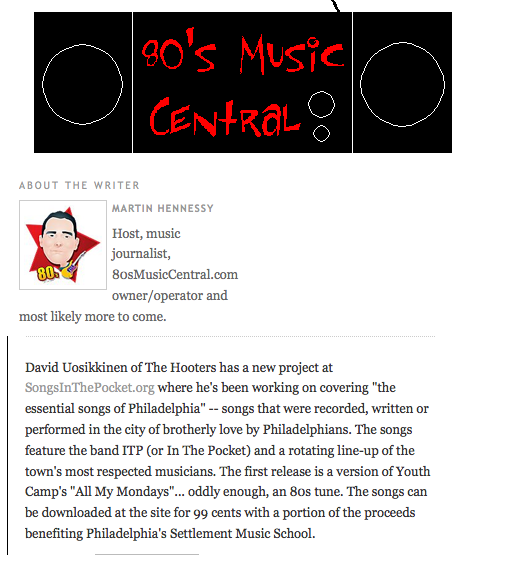 David Uosikkinen of The Hooters has a new project at SongsInThePocket.org where he’s been working on covering “the essential songs of Philadelphia” — songs that were recorded, written or performed in the city of brotherly love by Philadelphians. 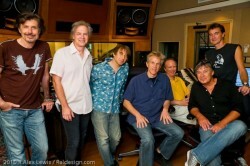 The songs feature the band ITP (or In The Pocket) and a rotating line-up of the town’s most respected musicians. The first release is a version of Youth Camp’s “All My Mondays”… oddly enough, an 80s tune. The songs can be downloaded at the site for 99 cents with a portion of the proceeds benefiting Philadelphia’s Settlement Music School. Essential Songs of Philadelphia available Online to benefit Settlement Music Schools! From the band that brought national attention to Philadelphia’s pop music scene, The Hooters’ David Uosikkinen is recording what he feels, are the Essential Songs of Philadelphia. 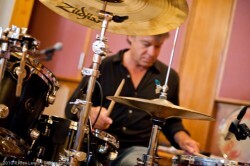 The songs that drummer Uosikkinen chose to revisit were either recorded in Philadelphia or written and performed by Philadelphians. 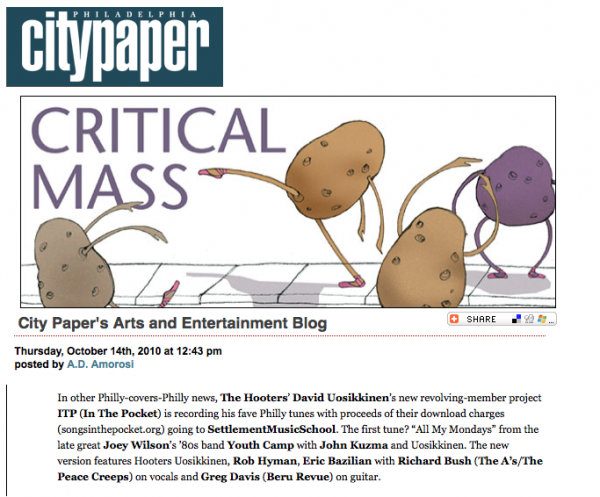 These essential songs will feature the band ITP (In The Pocket), a rotating line up of Philly’s most respected musicians. The first song, All My Mondays is available for download for 99 cents at songsinthepocket.org. Award Winning producer/director Steve Acito of Bluewire Media will produce a video documentary of the recording of each song. IN THE POCKET: ESSENTIAL SONGS OF PHILADELPHIA’s debut song, All My Mondays originally recorded by 80s band, Youth Camp. The new version features some of Philadelphia’s premiere musicians: David Uosikkinen (The Hooters) on drums, Eric Bazilian (The Hooters) on guitar/vocals , Richard Bush (The A’s/The Peace Creeps) on vocals, Greg Davis (Beru Revue) on guitar, Rob Hyman (The Hooters) on keyboards/vocals and William Wittman (Too Much Joy/Cyndi Lauper) on bass. Initially recorded in 1983, Youth Camp played the Philly music scene for a mere six months before calling it quits. Youth Camp’s lineup included lead singer Joey Wilson, John Kuzma on guitar, bassist Rob Miller and David Uosikkinen on drums. Joey Wilson passed away on Christmas Eve in 1998. 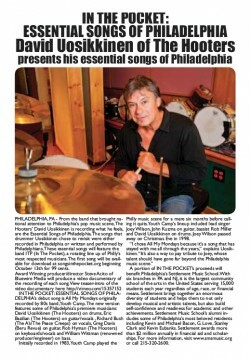 A portion of IN THE POCKET’s proceeds will benefit Philadelphia’s Settlement Music School. With six branches in PA and NJ, it is the largest community school of the arts in the United States serving 15,000 students each year regardless of age, race, or financial means. Settlement brings together an enormous diversity of students and helps them to not only develop musical and artistic talents, but also build self-confidence and readiness for academic and other achievements. Settlement Music School’s alumni includes some of Philadelphia’s most beloved residents including Kevin and Michael Bacon, G. Love, Stanley Clark and Kevin Eubanks. Settlement awards more than $2 million annually in financial aid and scholarships. For more information, visit www.smsmusic.org or call 215-320-2600.